Better Homes and Gardens recently took a survey that I found interesting. They asked their readers all kinds of questions to find out what they want from their houses now. The results covered decorating trends, how much square footage people think they need, the kinds of home improvement projects most homeowners are tackling, and more. Here’s what they said–see if you agree! 8 out of 10 said home ownership is still a good investment and an important part of the American Dream. 39% said they’re planning home improvement projects–up from 33% the year before. More people are remodeling baths than kitchens–31% versus 25%. Most would rather get rid of excess stuff than pay for a bigger house to hold it all. However, 76% said they need more storage space than they have now. 55% said their future home improvement projects would involve style upgrades on countertops, flooring, faucets and fixtures (up from 50% the year before). 56% said a house with no wasted space and a smart design are at the top of their wish list. 80% want a separate laundry room (yes, please–no more mudroom-laundry room combos!). Decorating trends that people are following include “statement tubs, even in a smaller footprint,” the “utility look with reclaimed wood and metallic finishes in cabinets and flooring,” and industrial lighting. The look, affordability, and efficiency of a home have now become more important than sheer square footage. The median square footage people said they need continues to drop each year, down to 1,791 in this survey. P.S. 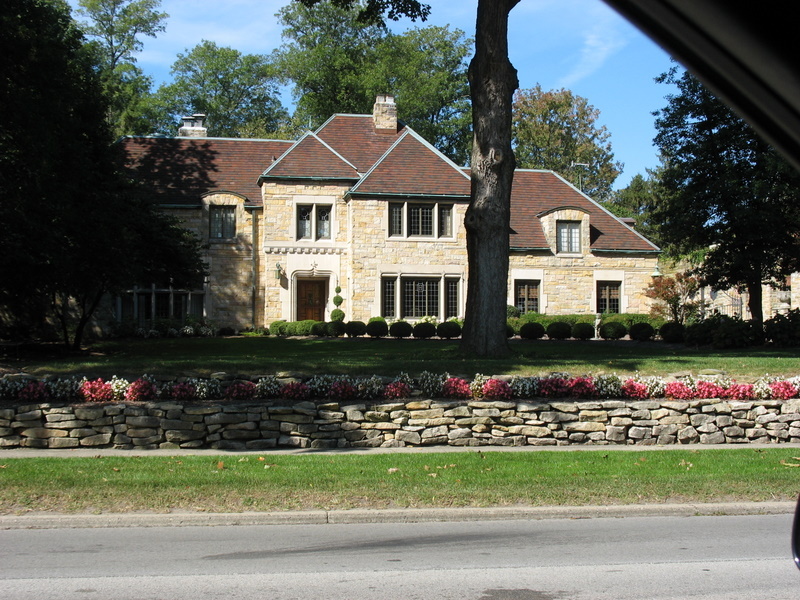 I couldn’t resist snapping photos of these lovely houses that I drove past in Cincinnati, Indianapolis, and Annapolis. Anyone else do that? This is very interesting. What about all the McMansions out there, I wonder? My house is about 1900 square feet. It’s about right. If I had more room I would just fill it up with stuff. I think most storage problems are accumulation problems which are usually decision-making problems. At least for me. I think it’s becoming increasingly difficult to sell those McMansions. I know there are a lot of them that sit on the market for a long time in my area, anyway. I did not see PRIVACY mentioned. I would like distance from busy roads, highways and airports. Lots of acreage for fresh air and family, friends, and pets. I love neighborhoods with large lots and mature trees. Odd thing about noise and busy roads. We are relatively near a major intersection but at the bottom of a hill. We can’t hear a bit of traffic. Our first home was farther from that intersection but without the advantage of being at the bottom of a hill. The traffic noise was so loud we might as well have been living right next to that busy road! so interesting! i really do like the trend towards smaller, more sustainable living. don’t get me wrong, a grand entrance with huge ceilings is impressive to me.. but whenever i walk into a home like that, i can’t help but think “i have to heat all this air!” 🙂 we like our cozy home and yes, we could always use more storage, much like those surveyed. but we could also do with less ‘stuff’ .. it’s a work in progress. and if you rule out the option of moving into a bigger home, you get pretty creative with using the space you have. i don’t comment often, but i read all the time and just wanted to pop in and say how much i enjoy your blog. Ana, I realize you wrote your comment months ago, but it sparked some thoughts for me. For years when I have seen the two-story entries and the two-story family rooms in the McMansions in our area, I have thought to myself 1) you have to pay to heat that, 2) it’s grand, but it’s wasted space, 3) the noise will travel up from the first floor to the bedrooms and 4) how in the heck do you get all the way up there to change a lightbulb or to CLEAN that light fixture? I wonder if people who have lived in those houses look for the same thing when they move, or try to go back to a more traditional floor plan without those issues. I know for a time in our area the realtors said you couldn’t sell a house if it didn’t have a two-story entry and a two-story family room. Oh, and you had to have a jacuzzi too. Well, in my neighborhood all of the houses have jacuzzis and I only know two people who say they actually use theirs. Same here! When my neighborhood was built, all the houses had the 2-story foyers and family rooms and all the master baths had giant tubs. Now everyone I know complains about how hard it is to heat and decorate the 2-story rooms, and I’ve talked to a lot of neighbors who say they never use those tubs. I hope those are trends that are fading! I definitely agree that home ownership is a great investment, however, I have (currently!) chosen to NOT renovate our kitchen (which could use new cabinets) and am instead installing an inground pool. The kitchen would actually give me a good return which is unlike the pool (we are not expecting any from that). So perhaps I’m not really following what I agree with ;). I guess it’s a good thing we’re not moving! I think that it is fantastic that the attitude toward space is changing. A smaller footprint with better materials is not only the stuff dreams are made of, it is better for our planet, our population, and our future. I live in a little less than 1,100 sq.ft. home that was built very solidly back in the 30’s. We might finish the attic if we ever have kids (another 300 sq.ft maybe?) but as of right now we just focus on keeping our home sturdy and happy, and finding or building creative storage solutions. We could have afforded a much larger house, but in the end this one just seemed perfect. Still does! That’s interesting about the downward trend in square footage. I would have never expected that. Mine is 1,600 and it’s just about as perfect as it could be. My current renovation dream would be to finish the basement so that I don’t have to do laundry in such a terrifying space. Good to know that something like that would potentially pay off. But I have zero plans on selling this house, I love it too much! And Happy Birthday Lily! I had a birthday yesterday also. But mine is several digits higher. Hope she has an excellent party! A main reaon median square footage desired could be falling in recent years: the aging Baby Boomer population. I am a member of that population, currently living in a 3500 square foot home with 5 bedrooms , a fixer upper that we fixed up and loved for well over 20 years. it was the ideal size for a couple with 3 very active boys. But now that the kids are grown we are thinking of downsizing and so are many of our friends. The most popular homes here are far smaller. If we were young, I’d still be interested in a home like ours. It seems cozier than the square footage might indicate. So what keeps us from moving? A gorgeous view and the fact that we haven’t yet found the home we want for te future.also the fact that the mrtgage is paid off ad the housing market hasn’t yet recovered. Fr agree homes. Mesnwhile, the smaller homes get snapped up. An example: just around the corner from us is what was once considered a modest neighborhood full of starter homes. They were full of young couples or singes or those with a couple of young children . Homes there are now moving faster than the ( much larger) homes on our street . …and they’re selling to an older population. A couple of years ago the opposite used to be true. So have the homes on our street fallen into disrepair? Do they look dated.? Nope. They are simply too large for today’s average home buyer. As you know, we just put our 3400+ house on the market because it is just.too.big. What I have found in telling people about our plans is that our peers, late 30s, early 40s with little(r) children think we are nuts. “Don’t you want/need/use all that space?” is what we are asked. On the other side, when I tell people who are 5-10-20 years older, they nearly send out a marching band congratulating us. I tell them not only of the plans to downsize the house but what the result will mean to us financially(debt free!) and they tell us it is the smartest move that they wish they had made years ago. I know we have made the right decision, although hard to say goodbye to our beautiful home, it feels so right! Now we are in search of many of the things listed in the article above. PS – house sold in 3 days, 6 offers and a SIGNIFICANT amount over asking. Another sign it was the right plan! Well, it’s sort of a circle of life thing, then! Good thing ALL the newly married, first time buyers on all the HGTV shows expect, not want, tons of square footage, bedroom for each kid and some spares, baths for all, and brand new, updated kitchens and baths! A furtile market with the generation behind mine!!! Although I prefer a 100 year old home with all of it’s charm, we chose to build for various reasons (location to family, etc). We built Michaela Mahady’s Urban Bungalow (Cottage Living’s 2006 Idea Home) and traded the price of square footage for quality and good design. We are limited in storage space (no attic and we finished the basement for a gameroom/office/playroom) but it makes us think more about the stuff we acquire. I have a separate laundry room and have banished the word *mud room* from being used to refer to any area in the home!! I think people often claim they would like to down-size, but in reality 1800 sqft is just not enough for a typical family of 5. Having said that, I do think 6,000 sqft houses can breed problems of their own. They can lead to disconnected families that aren’t given the opportunity to spend much time with one another. Also, we have been in our current house almost 4 years and have decided to spend our $ decorating the house well, rather than remodeling the kitchen, which sort of needs it. We learned in the sale of our last house (2008 – remember the market was plummeting then) that it was the fixtures, colors and general decorating that drew the multiple offers that allowed us to sell above our asking price. Although these are the very things realtors warn their buyers not to factor into their decision, it is what, in the end, sells the house. We are raising four children and two dogs in a 1600 square foot house. I realize this lifestyle is not for everybody, but we’ve lived comfortably in this house for over twelve years and the advantages of a low mortgage payment and excellent location far outweigh having more space. Patience, I’m impressed! Can I ask, do you live where the weather is mild? I think that where families are able to spend more of their time outside (as opposed to our New England locale) a smaller house would suffice. We live in Virginia, and you’re right that being able to spend time outside helps. There’s a small city park across the street–it’s like an extension of our yard and it means we can also be content with a very small lot. interesting. i wonder how many people would truly pick a 1500 sq ft home over a 3000 sq ft one, if given the choice. I just signed a contract on a new (for me) home. Much smaller than what I have now, but I don’t need all this room. Now that it is getting close to time to pack, I realize that having more storage means keeping more junk. The clean out isn’t pretty. My husband is all about the big houses (he doesn’t have to clean them) but big houses in our budget isn’t possible up here (Seattle suburbs) so he’s willing to “settle” for one about 3000sqft. That said, we have four kids and another on the way so some space would be nice. We’ve been looking to buy a home up here for over two years. The inventory is very thin. My second turned 9 on the first. Build a Bear tonight! We raised four kids in a 3000 space and two kids did share a room which was fine. Eventually, they grew up, moved out and I am grateful we do not have a larger home. In fact, I wish we could downsize. While I do own a house and am not about to go back to renting, I no longer believe that owning a house is an essential part of the American dream. That’s not to say that it’s always a bad idea to buy a house, but a house can really be a burden, as many people learned after the real estate crash. My sister and her husband recently sold their two Florida houses and she tells me she feels carefree to be released of that burden. Yeah, I was kind of surprised the percentage was so high on that considering how many people have been burned by real estate in the last few years. Of course, it may be because the people surveyed are BHG readers, who are probably more interested in houses in general. Was just thinking of the difference between the USA and Australia with rentals. I would own a shoe box rather then rent for the rest of my life. Here you get someone every 3 months walking threw your home to make certain that their house is ok, you can not do anything other then change light globes and clean, nothing on walls that don’t already have the hooks no gardening unless it is just mowing and weeding and if something brakes you have to wait for them to fix it (unless you broke it ie windows). Then on top of that you pay for not only the norms ie power and telephone but water and its connection. Yep let me have a shoe box of a house rather then Renting. PS. I am doing my Bachelor of Architectural Studies to become an architect always good to know what people are chasing for a home. Renting versus buying is an interesting comparison but I think people still want a home of their own. But they have learned some things from the housing crash. They learned, hopefully, to think of a home as something other than an asset guaranteed to soar in value, something to fund their retirement without saving a diversified portfolio of assets. Renters are nearly always subject to rent increases and limits on what they can do. In our town, no landlord agreed to let us paint walls and pet-friendly rentals are still hard to find at decent prices. I know.one of my sons has 2 cats and searched hard for a rental. He just found one. It took months. Meanwhile, ourmortgage is paid off. My father, a builder, told us to pay extra on our mortgage payments and avoid using home equity lloans or lines of credi unless absolutely necessary…and then pay them back as soon as possible. The result? Our monthly home maintenance and utility costs are lower than even small apartments here but apartment prices have gone up over the years here, more quickly than have our home costs. Might not be the case elsewhere. Because of what happened to my Grandmother, I’m almost afraid “not” to own my house. My Grandmother rented her house for 60 years from a dear friend and neighbor. For all intents and purposes, my Grandmother felt that this house was hers (she kept it up, she fixed things, she did improvements, etc). Well, her friend passed away and left the house to a neighboring church. These lovely churchy people decided that they didn’t want to deal with an old lady, so at the age of 87, they kicked my Grandmother out so that they could raze her house and build a bigger parking lot that they didn’t need. To say it was devastating to my Grandmother is an understatement. If only she had owned that house (lord knows she put enough money into it to own about 5 times over) she could have lived there happily for the rest of her days. Owning a home can make you vulnerable…but renting can make you vulnerable too, even when your dearest friend is your landlord. Oh, man, what a terrible story! I can’t believe they kicked her out of her house and tore it down. How awful. Wow. What an awful story. I’m sorry your grandmother had to go through that. It was heartbreaking, and difficult, but I’m happy to report that my Grandmother is still living in her new digs (senior apartment). She’s 92 and just keeps on keeping on. Still, I’m going to make darn sure when I become a Senior citizen that I own and not rent. This reminded me of what happened in my parents’ neighborhood. The land across the street from my family home belonged to the same family for over 100 years. There were 2 houses and a large forest between with hiking paths, horse riding trails and sledding hills. The last remaining relative died and left the land to her church, who used it for their annual nature retreat. Within a week they had sold it to a developer and now it is the land of McMansions. After putting up 2 subdivisions, the developer was forced to stop at the site of the old farmhouse. It was over 100 years old and a historic landmark. Within weeks it had mysteriously burned down in the middle of the night. The police proved it was arson, but could never prove who did it. Now it’s yet another subdivision. We are finishing our ‘bonus space’. It’s about 550 sq feet that will become a second Family room/workout room/guest suite. ‘Someday’ it will have an en-suite bath. A portion of the space adjacent to my master bath will become a 2nd master closet [Yippee!] which will really give this house a step up from the other houses in the area. I have the wide-ish pine plank floors here, just have to install, sand and stain, and the gas stove [Vermont Castings] is at the store waiting for us to finish the floor to install it. That will be the only heat source for that occasionally used room. We’re doing it all on a tight budget, and also taking our time because it’s the last real room I get to do the way I really want to. Our house is 2700 sq feet for the 3 of us [and the 3 dogs and 3 cats]. We truly only use half of it. I looked at a 3000 sq foot house for sale in my area last weekend, and the open to the 2nd story entry and family room had me shaking my head over the wasted heat. Hopefully those days are gone and we are all more conscientious about our resources. People are more likely to re-do bathrooms than kitchens because the kitchens were all just re-done. we are doing our first ever kitchen gut and redo. I told my husband, and he agreed, that this one better last till we’re dead!! EVERYTHING costs so much, and we are excellent bargain hunters and frugal!!!! If our 401K “investment” tanks again, this time we will have spent it on an investment in our home, and someone else’s future home, if we ever sell, vs. losing what we *could* have spent on a swanky kitchen redo four years ago!!!! With the aging baby boomers -things like one-story, wide doors, easy access shower, larger dining area for entertaining at home. My husband and I are in the largest home we’ve owned- 2500 sq ft with a separate 220 sq ft building which houses my workroom. And we have more stuff than we’ve ever had! I have a dream of owning a small house- no larger than 1500 sq ft- when my bonus daughter finishes college and moves on. I grew up with 4 sisters in houses no larger than 2000 sq ft, one of which (when we were teenagers, no less!) had only one bathroom. And we all still love each other! How I agree about the laundry room / mudroom combo! I cannot seem to convince my husband to not leave his muddy shoes in front of the dryer! After 35 years of marriage, I know hubby and I will down size soon. We could live nicely with 2400 sq ft, allowing me to have a large quilting/sewing room, for hubby to have a study and still have extra bedrooms for visiting family members. What we need less of is yard. We no longer want to spend so much time in the yard. I could live with less square footage but I really like lots of storage, closets, bookcases. There are some collections I am not ready to part with yet, so I want to keep things behind doors. I would rather have a master bath and closet redo, along with a better laundry room for folding clothes etc. I definitely want to design the next house….probably the final one before the nursing home! McMansions available in NE Ohio as well. The updated finishes move faster. Buyers expect a lot today for their dollar and want move in ready. I wonder at the buyers who see size but don’t consider what it takes to maintain? Huge laws, heat/AC. Still family size & age along with value determines much. Great post. I do agree and as a home owner myself of a slightly smaller home then the average, I think usable space is more important then a LOT of space. That said, it would be nice to upgrade a little with twins on the way. Since the beginning of time, humans have yearned for their own home. I don’t think home ownership will ever not be desirable. We live very comfortably in a 1800 sq ft home and use almost every room. The big houses…too much to clean and maintain and the unused rooms lend a lonely vibe to the house…been there, done that and so over it. Give me a cozy, efficient cottage anytime. I live in Atlanta, home of the McMansion. Over the last 20 years or so, I’ve seen beautiful pastureland out in the ‘burbs turned into Roof Farms full of 6,000 sq ft homes that sit crammed right next to each other….such eyesores! I am glad to hear that America is waking up from the McMansion nightmare and yearning for real, practical homes. I cringe every time I see some newbie home buyer on House Hunters or My First Place demand that they must have a 2 story entry way with multi-story windows because to do otherwise doesn’t feel “light and airy enough”. What they don’t realize is that you have to heat/cool, decorate and clean those monstrous, impractical rooms. And I’m sorry, but no one needs 6,000 square feet unless they are raising a soccer team. As for me, well I live in a 100 year old small urban house in Atlanta. After 11 years of ownership, we finally have saved up enough money to renovate. Oddly enough, we will be upgrading the bathrooms (and the kitchen too for that matter) and adding a laundry room. We will still have some “wasted” space though. Our house comes with a large central Victorian hallway that spans the length of the house. There’s not much you can do with that space, but I would never take it out because it’s historic to the house and makes it unique. The central hallways are so beautiful and they were built that way for air flow, so even though you may not be opening doors front and back, it will be a benefit to have the hallway. It’s nice to have ‘breathing room.’ Your home sounds lovely. I live in Atlanta also and some of those mcmansions look more like office buildings than homes. I always think of the multiplication factor of replacing carpet or shingles or painting and what it must cost. As far as central hallways I was in an older home once that had lined the halls with bookcases full of books. There was a small niche with a comfy chair and a reading lamp. I felt like I could sit there for hours. Plus so many of us never have enough gallery space for paintings. David- that’s exactly what we are going to do with our hallway! We plan to make it a gallery for our “artwork”. We don’t have anything fancy, but we do have a lot of neat stuff we like to look at. I have demanded a little nook like you’ve described in our home office. I would love to have comfy little place where I can sip tea and while away the hours reading a book. MsJulie that’s exactly how they did “air conditioning” back then. They’d open the front door and the back, and then let the breeze flow through. The first things folks ask us when we say we are renovating is “are you going to get rid of that wasted space in the hallway?”. There’s no way I’d ever remove it! It makes the house unique and it gives it some of that “old southern” flavor. We are just barely getting started, but if you’d like to follow along with the reno, you can at my blog at myoldatlantahome.blogspot.com. We just got our permits and should be breaking ground next week, so there’s not much on it yet, but things should heat up fast! 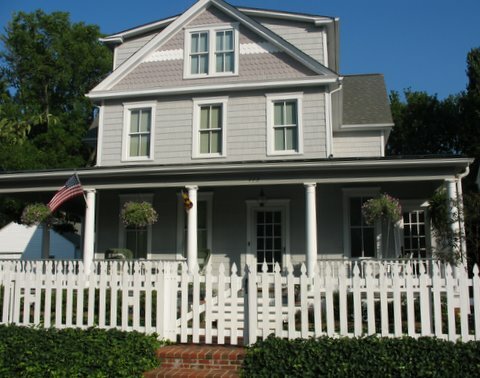 Our 1920s house is about 2400 sq ft, a hybrid of Arts and Crafts and Colonial Revival styles. Though they don’t run all the way through the house, the entry hall and upstairs hall are each 8′ x 15′ and the large stairway/landings footprint is about 7′ x 13′ on each floor, so essentially it’s more like 2000 sq ft of “room” space. But I wouldn’t change a thing! Upstairs we built a large wardrobe closet on the longest part of the wall, with built-in bookcases on its ends. There’s a dresser across from it and the hall passageway between closet and dresser is still a lot wider than upstairs halls in newer homes. In the entry hall we’re adding floor to ceiling bookcases on one wall and also have a desk and cabinet in there, without crowding. Since most of our rooms aren’t large and original storage is minimal, we’re using these hallways as “rooms” since they’re basically the same square footage as our bedrooms, just with more doors! I have a separate laundry room – I hate the mud/laundry room idea – I also like the laundry room located close to the bedroom. I only wish we had made it bigger so I could have this as my ‘folly’ – combine it with my craft room, have a tv in there, a sofa – just my hang out. Interesting survey. My house is tiny, but we make the best of what we have. It teaches us to be very organised and it stops us buying stuff, that we don’t necessarily need (the hubby loves this point)… The hubby grew up in a McMansion and said that it really affected family life, as they all could be off in separate corners and not interacting, whereas our little old house forces us to get along. On the whole, I think the best thing to come out of this housing crisis, is that people are now viewing their houses as homes and not just financial investments. I’m sure most will disagree, but we have an 1,800 sq. ft, two story house that is 4 bedroom and 2.5 baths and it’s just me and my boyfriend…and I still want more space. We have a large kitchen and two living rooms, but I really want a formal dining room separate from the eat-in kitchen. We are in our early 30’s so maybe it’s the age, but I keep saying I want a bigger house. I think 2,500 is perfect. I just want the dining room! It’s not the size of your house, honey, its just the desire for a dining room. Which is perfectly understandable. Turn one of your living rooms into a dining room? I think it all about the upgrades more now than ever. Homeowners cannot sell their homes for many reasons, market value, difficulty with obtaining loans, etc. The alternative is actually a great one: Why not change, update, and improve the home you already have? Bigger is not necessarily better. One of my clients with a family of four recently put their house on the market – 4500 sq ft. stating too much house – too much upkeep, in addition to a substantial increase in utilities, property taxes, and maintenance costs. That’s so funny — as soon as I read that one of those houses was in Indy (where I grew up and lived until I left for college), I scrolled back and immediately saw the obviously-on-Meridian-street house. I don’t think driving down that street ever gets old with all of those houses to ogle! It really doesn’t! There’s one great house after the other on Meridian. Used to love my drive to work! Stop by Indy for the Decorators Show House this year. On the corner of Meridian and around 71st Street in a legendary home that hasn’t been open to the public before. I can’t wait to see it! Guess parking will be at Park Tudor school? Remember getting cider at Lilly Orchard? Still has great cider! We live in a small town south of a large city, on about 12 acres. Our house is 4200 square feet not counting the finished basement. I would love to downsize, but where we are now we have room for aging mothers, if they want to come and live with us. One son spent six months with us between jobs, and all our three kids come home from college and jobs in other states to spread out and relax in the country. They love the idea of coming home for Christmas with their families someday, as do I. Being the “center” of an extended family is a worthy role for a nice big house, if one has the finances and fortitude for that. Larger homes are not always bought for show and pride….and there’s more than a little eco-reverse-chic snobbery among people in smaller homes these days. Well said!! There are reasons for large homes indeed. Not everyone has 1.7 children! We are in the preliminary stages (finding an architect) of preparing to build a new home. We are thinking 1800-1900 sq ft max. No excess living space (i.e., separate living and family rooms) or excess space (unnecessary hall space). Would love 4 bdrms but will compromise down to 3 (I have 4 kids) and 2 baths are a must. A separate laundry room ( 4 kids = massive laundry) and an entry way that can accommodate sports stuff, jackets, backpacks, etc.). Easy upkeep design and materials would also rank high. Make sure you ask that your master bedroom is not near the living room. Mine is and anyone in the livingroom can hear noises in the bedroom and the bedroom can hear all noises in the living room. So if i try to go to sleep early and my husband stays awake, I can hear the tv through the wall. If I could change anything about the house it would be this. Interesting point! I’ve never had one near the living room, but now that you mention it I can imagine how that might be an issue. They seem to be commonly put on the other side of living room walls in two-story houses that have first-floor masters. That’s where I usually see them, anyway. Easy fix put noise reduction insulation in that wall. We have a first floor master near the living room, but it must be well insulated? I can be standing in the living room and still see my husband in the bedroom but not hear a word he says. I still think home ownership is a good investment – even through all the housing market turmoil! But it’s true, people are getting smarter about what they buy, rather than the huge status-driven McMansions to keep up with the Jones’. I feel that I don’t really need more space than 1,800 sf (just too much work to clean) but I do value good storage solutions! Well in my area they are still scraping off older bungalows and building McMansions, despite that some of these homes are being rented or not selling quickly. I live in a smaller, older home and there are times when I wish I had a bit more space, but I’m glad that I still have a home considering the economy and growing up along the coast in Calif., where real estate was always expensive made me realistic. I still get angry thinking about all of the people who got burned all due to the foolishness and greediness of others. As for my home I work with what I have and try to make my home function well within the confines of smaller spaces. I don’t want to accumlate a lot of stuff either, because that can turn into a real burden. I already remodeled my kitchen and bath, but can see in the future another update of the bathroom. I don’t have a basement or an attic either, so I would like to finish the garage and then build another shed because I have the yard space. I forgot to add that I have a combo mudroom and laundry as well as pantry off of my kitchen, which is separate, but it works. I’ll probably have to update with new appliances as the other ones are on their last leg, so I’ll incorporate a plan to make it work better. I’m finding that there are better ideas and resources for people looking to maximize the use of a small space. I guess necessity really is the mother of invention. Great survey but I’m curious on the demographics they targeted. I’m living in the SF bay area and believe me, size still matters. I raised my two kids in a 1600 sq ft home and it probably was a good size for us except that the home design was the problem. I had no formal eating space except for a kitchen nook and with my husband’s large family living around, it was such a pain to handle large family meals. Finally bit the bullet and turned my formal living room into a dining room in order to get that space I needed. However, when the kids were out, we bought our dream house and it was 3200 sq ft. I loved the extra space because the space was simply used differently. I finally had an exercise room, a formal library space for all my books and that large family room/dining room for our large family gatherings. After 5 years, we did downsize financially with our mortgage by moving to the next town over, bought a 3300 sq ft house but my mortgage payment dropped by 2/3. It was important to have the extra money to help our kids get into homes. My dream was that the larger house was that my kids and their families would come home for visits. I have grandkids now and my son is back home temporarily so it’s working for now. I think home ownership will always be the dream. Renting a house doesn’t give me the authority to change wall colors, update fixtures and such to make my house my home. My in-laws own rental property and although they update carpets they never sunk money back into updating baths/kitchens/windows, etc. However, one day I may sell and truly downsize to a lakefront cottage that is much easier to maintain, and just visit my kids in their homes instead! I am happy with the 2700 sq ft of my house. However, I would LOVE it if I didn’t have a formal living and dining room and donated the space from those rooms to a bigger kitchen and family room, creating a true great room. Maybe someday! Happy to see the new trends in that survey – smaller is the way to go. I’m looking forward to seeing HGTV following that trend. It would be nice to see more shows about people who can think creatively when buying a house, instead of ruling it out because it doesn’t have granite or they don’t like the paint colors! It would also be nice to see furniture makers start designing some more realistic sized pieces, although I mainly buy used/antique furniture (such a better value!) and I will always love our 110+ year old house. I also think size and layout depends on the number of people living in the house and the personalities. Some people need alone time, some need constant interaction. I’m selling my 2,100 sq ft home and looking for one around 1,200-1,400 sq ft. Lots of reasons for the downsizing, but the primary one is all the unnecessary space. Yes, it’s nice to have an office, a sewing room, and a guest bedroom, but I don’t need dedicated spaces for those things. Too much upkeep, too much heating/cooling cost, too much extra spent in property taxes and mortgage payments. I’m definitely in a streamlining and “right-sizing” state of mind. Fingers crossed for a quick sale! Agree on less space, although as empty-nesters I still like the fact that we have 4 (very snug) upstairs bedrooms in our 2100 s.f. home so the kids can come to stay sometimes. Also agree on the laundry room thing. Our 1982 house had a teeny tiny mudroom/laundry combo, which was probably cutting edge at the time, but we put the laundry in the basement where I have space to dry things flat etc.. It’s what I was used to so I don’t even mind the stairs. Probably good for me as this body ages anyway. Wow, people in America are lucky. 99% of the time, people here in the UK just have their washer and dryer in their kitchen or something. I’ve never met a single person with a laundry room. Or a mud room for that matter. You just…. walk into the house. It’s true, we love our laundry rooms and mudrooms here. I imagine a lot of it is because our houses are so much newer than yours in general that we get things like that. I’ve been to the UK a couple of times and you’re right, it’s common to see the laundry in the kitchen, and I don’t recall seeing any mudrooms, either. That is soooo true ! Many mudrooms in older houses are converted porches or breezeways. My old row house had this — laundry/mudroom in the back off the kitchen. Loved the convenience of a first floor laundry, but it was tiny. My current laundry is in the basement – not too convenient, but plenty of room to hang things up and have a folding table. Growing up, our washer/dryer were in the kitchen, and with 4 kids, it was constantly busy. Don’t know how my Mom kept things organized! My wife and bought our home for our son and daughter and 2 shih tzu’s and now have 1 daughter and 4 shih Tzu’s living here. We have livingroom,diningroom, familyroom,sunroom, dining area/kitchen,half bath, laundry room downstairs, 4 bedrooms and 2 baths upstairs and a familyroom/den in the basement. We have a 12×50 unfinished area in basement and 2+ car garage on large city lot. We are homebodies and always have been. The front porch welcomes us home and the neighbors are the best. We relax by fixing up our 34 year old house. We love having family and friends over and fill every room. We also like to hole up in the basement an watch a movie with the pups. Our home is larger than 3000 sq ft but was less money than the smaller houses in the newer section of town 4 blocks away. The new everything didn’t apeal to us as much as the older house details and the “family home” feeling you get walking in the door. It is better than any place we have lived before, including the house we built. Our family of 6 ( 2 adults, 2 kids and 2 French bulldogs) like in a small, stone cape code. I LOVE tiny houses and our tiny house lives BIG! I have more storage than some new homes. I have added custom built- ins EVERYWHERE I could find space. ( Behind knee walls, reconfigure spaces while staying in the same footprint.) We moved our laundry room to the top floor, utilizing empty, unused space behind a wall. It’s all about function and storage. I couldn’t imagine living anywhere else! I think some people don’t realize that more stuff = more stress. When you have less stuff, there is less to store, less to clean and less to weigh you down. If an item is functional or sentimental it’s stays. If not – It has to go! Those houses look lovely, and yes, I’ve done that. When I was growing up my parents liked to look at houses after church on Sunday afternoons….so snapping photos and dreaming of what a house “could be” is in my roots. Have fun tonight! Happy Birthday, Lily! I do agree that a home is still a wise investment. We have a 2400 sq. ft. home and it is just the right size for our family of 4 +2 dogs ~ not too big and not too small. Several years ago, we lived in a 1600 sq. ft. home and it was good, too (well thought out floor plan with no wasted space). I do like the extra square feet now ~ It’s roomier, yet still cozy: ). But I think it’s whatever your preference is. Big or small, it’s the home like cozy feeling that is important. I also love your blog! My daughter and I came across it one day looking at t.v. show houses online. We think it is so much fun! And love your dog, Maizie! We have 2 shih tzus (Winston & Buster) ~ Shih tzus really are such good dogs: )! We downsized about a decade ago, once the last child was gone. Down from 7000+sf to about 3400sf. We really can’t stand the downsize, especially when everyone comes home, with significant others and grandchildren, and sisters, and nieces and my mother and the dogs, and friends – I long for that old big house. So crazy us, we are looking to upsize, in our age bracket of mid 60s, but like reader Karen said above, less land. We live in a zip code where 6000sf is a regular size home; McMansions around me are 12 to 15,000sf and yes, they are having trouble selling but not because they are so large, more because they have zero charm or character, all the same with wine cellars and exercise rooms but no concept of how real people live. A big house can be very warm and inviting if planned well. We strongly believe in the America dream for our children to the extent we helped each one buy their first place. We wanted them to understand and respect the process of responsibility, of saving, of caring for a home, and hopefully watching its value grow. Our younger daughter wants to sell hers already (she’s moving) and the value of her home has gone down as much as 35%. She will learn one of the downsides of home-ownership – not every house grows in value. My home is smaller in size than that of my sister’s yet I host most of the family gatherings because my home has a more welcoming space for large groups. We have made our home function for the way we live and if you do that square footage doesn’t really matter at all. We have a large dining room and family room which is perfect for family gatherings- family is our priority- in exchange I live with a very small bathroom and master bedroom but life is all about priorities and compromises- not having it all. We believe in living below our means especially when it comes to housing but by being extra creative and making the space we have super functional- it serves us well- as is paid for- that is the very best part!! I have the opposite in my house. I have a small living room and a bigger bedroom. I thought it was great until the first time the family came over and we were cramped. Now I realize that we spend more time in the living room than the bedroom and the bedroom space is really just wasted. If I own another house I am going to remember to look for that in a new house. The Husband and I were a family of 8 (now some kids are grown and off on their own) and the largest home we ever lived in was 1600 sq ft. I can’t imagine ever living in a larger home. I was constantly busy and having the smaller square footage made cleaning so much faster and easier. It’s amazing how quickly the house can be tidied up in under 10 mins with 1 Parent and 6 kids before dinner and bedtime. Toys were only sometimes an issue but taking less than an hour once a month to go through the toybox and automatically throw out any broken toys made this easy too. I didn’t worry about having too much stuff either. As each season changed I went through all closets, sorting and getting rid of things no longer needed or the kids outgrew. For us, space was just never too much of a problem. I design/contract landscapes. Business is BOOMING. Ha, since the economy tanked. As someone who does landscaping, I can tell you we need to rethink the front door and car space. The traditional front door with a path leading to the road is leftover from the days of horse and buggy. The horse drawn vehicle would come from the barn/mues and the lady of the house would gracefully walk out the front door to her carriage. Nowadays our fronts look like motel parking lots with cars seen from the major house windows. Most people have so much stuff in their garage that they do not park in there and just use it as casual house entrance. I would like to see a system where cars are parked in the back of the house and the front part of the house is designed more like a courtyard, which gives privacy from the street and makes for a nice transitional entrance from outside to in. Such a design would also eliminate lawn. Large lawns should become a thing of the past. The first poster said she would like to see 5 acre properties, but people do not realize how much work is involved in keeping these little fiefdoms looking decent (not even great).Privacy can better be achieved with properly designed houses and surrounding gardens . I could go on about how I would like to see the end of traditional”foundation planting”, but I’ll save that for another post. I agree with Dina as someone who does her own landscaping. I do have a traditional walkway because I live in an older home, but I do so love courtyards–the privacy they provide, which I so desire and crave. I’m constantly working on getting rid of lawn as well, because I live in the arid, drought prone West. The trend here has been huge homes on small lots with small yards, but that makes the homes feel too close and dense for comfort. And usually once they start the scraping off process–that tends to kill the larger trees. I really wouldn’t want to open up the windows if I had to look at my neighbor’s yard or house. I’m lucky that my smaller home allows for more privacy, but I think that would change if a 2 story McMansion was built next door. My preference would be for cars parked in the back as well. I totally agree with not parking at the front of the house. We have a winding walkway from the driveway (which is located at the side of the house) to the front door. We have 10 acres and it is too demanding. 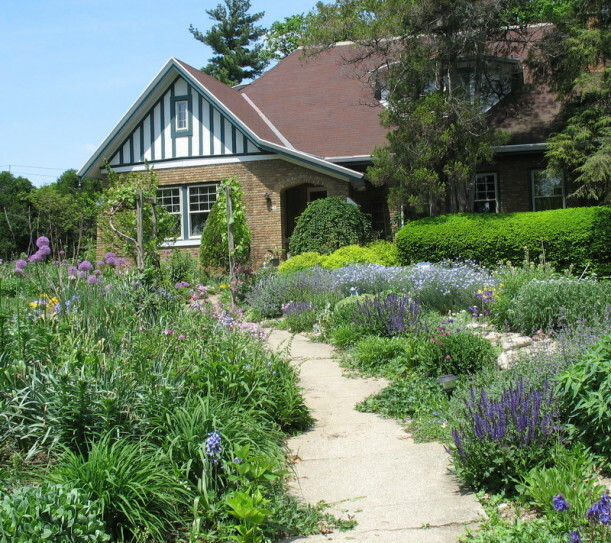 We also need to figure out what to plant in our large front yard without blocking our views. I agree, absolutely. Also, designing neighborhoods in which each house sits on a five acre lot is a huge waste of space and natural resources. My city lot is barely 1/10 of an acre and I don’t have the energy to do much upkeep on even that tiny space. I can’t imagine dealing with five acres. I love the idea of rethinking parking. I live on an old street and the houses are lovely, but the cars are really an eyesore… Most of the driveways are very small, and not everyone has a garage. Actually, not everyone even has a driveway. I second that! There’s alot of houses that have nice entry ways but because the cars park to the side, everybody including guests come through the garage! We built a 3 story, 3200 sq.ft. modular. We’ve got a circle driveway, so the real front door gets used everyday. Speaking of modulars (they ARENT trailers! ), ours is so energy efficent that our heating/ac/electric bill is under $200 a month, alot of times its below a $100. My parents live in a tract house and their bill runs $400 some months even though they keep the AC on at 80 degrees in the summer. We also saved $40k over a similar (and much smaller traditional stick built house). The builder installs the brick foundation, meanwhile the house is built inside a factory. Everything is installed including the drywall, trim and kitchen cabinets. Then the sections are loaded on trucks and driven to the location. A crane and a crew “set” the house on its foundation. Our’s took a day. We moved in 3 months later. There’s very little waste from building and the building materials don’t get ruined sitting out in the weather. Also its easy to stay on budget. I think we came within $300 of our quoted price. In places where labor costs big time $$, like Martha’s Vineyard, modular mansions are very popular. The average house can cost $400 a square foot, a similar modular house costs $200. We’ve lived in this house for 3 years and love it. We’re in our 30s and hope to live here until the nursing home! In our area, builders only half finish a house and that half usually has severe design flaws that must be fixed by the owner. For example they put in furnaces too small for the space, water heaters that only last 5 or 6 years. Bathrooms have doors so small that parents cannot take a small child or handicapped child into the room without difficulty. Many of the doors to closets are badly installed and badly designed. They don’t close or are crooked. They paint rooms with primer but not real paint, and then the first owners do not paint, so all rooms have to be painted. And I really hate the habit of putting in aluminum windows that need to be replaced for insulation. We live in an area that makes homes expensive so they build them as cheaply as possible. That is why so many people have to remodel. That is not going to stop and it is very wasteful. Your UK commenter hit the nail on the head…in European homes, square footage is less of an issue than in the States, and washer/dryers are commonly in the kitchen or “utility” room, and “clothes horses” are the norm here in Ireland (plastic-coated metal drying racks that you stick in an extra bedroom or in the hallway). I had the most trouble getting used to that, as in Ireland rain-free days are few and far-between, and I miss my tumble-dryer! Now that we’re moving to France (in less than two weeks – yikes!) we are going to a 400-year-old former hunting lodge, with two-foot thick stone walls, that needs a lot of work, and it is 2300 sq ft. We think we can be aging hippies (although we weren’t hippies before:-) and make the best of our space by leaving it unmodernized. But I will still need a tumble dryer 🙂 I guess what we baby-boomers are realizing is that oil prices keep rising and we can’t afford that (for ourselves or our children or the world) anymore. Well, if she survived, that gives me hope that I will, too. 😉 Thanks, Laney! Thanks for sharing this survey. To add to the discussion about home size: according to the 2011 Profile of Home Buyers and Sellers from the National Association of Realtors, the typical home purchased was 1,900 square feet in size, was built in 1993, and had three bedrooms and two bathrooms. I agree with the survey. Ours is about 1,600 square ft. for the 3 of us, But I want just a liiiiitle more space for guests. I would much rather have a large back yard with an 1800 sq ft home than a 3000 sq ft home on a 5000 sq ft lot. I do take photos of houses when I travel! I will take some when I go to Indiana soon and when I get back to Calif., I will try to scan some photos I’ve taken in the past. This is really interesting! When my husband & I were newly married and bought our cape cod (with three bedrooms), we had several ask us right away when we were going to move. We didn’t even have kids yet and so many were jumping ahead to the idea that every child needs their own room! Sigh. I’m glad to see the results of this survey. Thanks for sharing, Julia. Interesting survey. We’ve always bucked the trend. We don’t necessarily look at square footage, we look at layout. We went from around 3000 square feet to around 4200 square feet. Both are almost a hundred years old and in need of serious repair. One house repaired and sold. Another very large project just started. Not everyone can live this way, in a state of chaos. Yes, bigger houses are definitely more difficult to maintain, but if your thing is to buy an old house and fix it up, then it’s great. I think that if a house has the right kind of storage, that’s what makes the house appealing. And not sharing a bathroom with your kids! Love the photos of the houses you took. I take photos of other people’s houses all the time. I DO think owning your own home is still very much the American Dream. It’s just more difficult to achieve these days. My house is 1,400 square feet and it’s more than what I need. That said…I would like more closets and a laundry room. My house is old…and I’m lucky there is a washer in dryer in it at all….even though it’s in a closet. I have never wished for a big house…only a nice small house. I’ve been in McMansions that the quality of everything in the house was so poor. That is not living big in my book. I’d like a bigger kitchen but I will probably never make it bigger because what I have in my little galley kitchen is plenty for me. If I could spend money on any renovations…it would be to make the backyard a beautiful retreat and to make half the garage into an artist’s studio. Very interesting. Our home is about 1600 sq. feet and it’s perfect. I can’t imagine caring for a bigger house. I’m not sure if houses are still a good investment, but I am a house person. I wouldn’t want to rent. I like that it’s mine to do whatever I want with. Location and privacy are the most important to me. Hi Julia over here we don’t have mud rooms but we do have a laundry room some are small (mine) others have larger rooms (now that’s lucky) I’ve noticed some of the houses in the UK have their washing machines in the kitchen which surprised me (no more complaining about the small laundry) . The Great Australian Dream is to own a home but it comes with great hardship at this time women find themselves having to choose between owning a home or having children and putting them in daycare I do feel for them because I had to leave my daughter in daycare many years ago and then my parents looked after her I do have regrets (I missed out on so much) didn’t know it until I had my son 19 years later. So when it comes to more storage or bigger space sometimes there are no choices it ‘s what you can afford without all the financial hardships. The size of our home is enough for us but the garden has too many plants so we have decided to make the garden easier to look after. Regards Esther from Sydney ….. PS Hi Lily hope you had a wonderful birthday….. This article sums up our thoughts when we just built our 3br/2ba house last year. We thought if my mom’s family of 5 could grow up in a house with 1400 sq. ft. then so could we. Our previous house had the laundry in the basement. Never again. Our new laundry room is right next to the master and it is the only way to go, everything is on one level. The open floor plan is also number 1. The kitchen, living and dining have no walls or even ½ walls to divide when entertaining. Everyone feels included when we have get-togethers with 10+ people over. I have friends that have larger homes that are just not conducive to entertaining (closed off kitchens etc) and everyone seems to end up at our house due to the layout of the one main 20×28 room. Bigger is not always better for sure. As for clutter, my Mom now thinks we will run out of room once we have kids. I say if the extra “stuff” doesn’t fit….. it’s gotta go!!! Sure it’s nice to have a place for guests, but really…. If it’s not your immediate family that’s visiting, most rather just get a hotel anyway. @ Christina from Dallas, yes we have our Master right off of the great room and sometimes the noise is an issue. But it’s not something I regret in design. We knew this when we were building and made sure we sound proofed/insulated every interior wall. (most builders aren’t spending the time/money to do this anymore, only exterior walls). This helped tremendously just as Bel said. A couple pieces of sheet rock will keep no sound out what so ever. Less yard is great too. We have just enough but not too much. By the time you heat and cool a larger home or water a larger yard, the money instantly disappears. A few years ago I upsized from my starter 1,200 sq ft starter row home (that I had for 15 years!) to an old stone cape cod that’s 1,600 sq ft. I gained a huge back yard that I love, and a TON of storage, as well as rooms that are very flexible. The elderly couple that I bought it from had downsized into their own house by closing off the 2nd floor, and either the dining room or den can be used as bedrooms, since they have closets, and the largest bathroom is on the first floor anyway. If this is my “forever” home, I’m thinking of doing that too. As for upgrades, my kitchen cabinets are good quality but outdated (grainy oak), so I will probably paint them at some point, and give it a “cottage” makeover. The first floor bathroom is ugly (grey and maroon tiles with salmon fixtures! ), but not in bad shape. The renovation that I’m dying to make would be to convert my patio into a screened-in porch or sunroom, build a deck off the dining room, and change a double window into French doors. This is where I would spend my money, since I would spend loads of time in these spaces. I’d also convert the dining room into a cozy breakfast room. But, since I lost my job in December, everything’s on hold. I still have fun dreaming, though, and scour sites like these for lots of good ideas! I don’t understand why people want to downsize. I want a larger house where children and grandchildren can all be there at the same time and no one will be on a blow-up bed! Fascinating topic. I would like to point out that people are responsible for their own actions/decisions (i.e. their mortgage loan). I think it’s sad that builders can get away with using sub-standard materials and as a result buyers have to remodel fairly new homes. I’m all for smaller, older (better built in most cases) homes. There’s a reason why the houses built across the pond are still standing today….things are not built to last now. Vinyl village? No thank you. Great article and nice pics! Our last house was 2100 and it was perfect. I could have stayed there forever, but we had absolutely NO yard(it was considered a patio yard)…and with two boys, well, we needed yard. We moved to a 3200 sq ft. Home in the same neighborhood and it IS great having the yard, but I often miss the old house, the nice floor plan it had, the nice touches, and the culdesac it was on! oh well. Inthis housing market,we’re stuck here…so I just keep adding little touches overtime. We live in the first house we bought, nearly 20 years ago, before we had children. It was 1800 square feet when we bought it, but a remodeling brought us to 2100 square feet. It’s just the right size for our family of four, and it won’t be too big for us when the children move out. My parents still live in the house I grew up in, which was about 1500 square feet, until a few years ago when they added a huge great room to accommodate all the children/spouses/grandchildren during the holidays. I keep that in mind when I think about my empty nest phase. I may want a bigger house if I have lots of grandchildren!! I was reading that the trend of children moving out and establishing their own households in their 20s may have been an anomaly of the baby boom generation. The trend now may be swaying towards adult children to continue living at home for longer periods of time. Our current home, while great for a family with children or teens, isn’t well suited to having an adult child live here, so my husband and I may find ourselves looking for a bigger home if one or more of our children needs to live with us after college. Either that or we’ll have to tear down our garage and build an in-law apartment! When we bought our retirement home six years ago, I knew I had exactly two years to sell or give away half of everything I owned, as our “new” place is less than half the size of the old. It was a very interesting experiment in finding out what we value. It surprised me how much fun it was, especially when it made the recipient so happy! (And since we moved from the Pacific NW to Maui, giving away our winter clothes was a blast.) I squeezed extra storage into our remodel, even finding “kick plate” drawers for the kitchen, perfect for baking pans. Our bedrooms are tiny, my pantry is in the garage with the washer and dryer, and yes, you do have to sleep on an air mattress if you visit, but I swear it’s all worth it. Living small no ka oi, as they say here (is the best)! we are happy with the downsize. If money were no object, I would buy it regardless of the impracticality, and expense. Also regardless of how we are not finished the (much more modest) Victorian we’re in now… How quickly I forget how stressful the restoration process is! 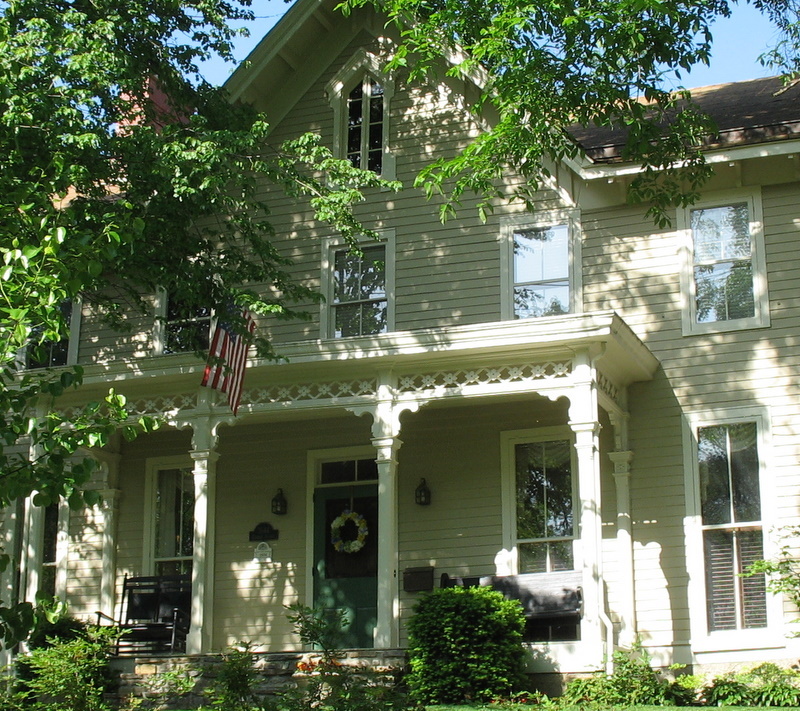 I grew up in a huge Victorian… 8 bedrooms, turret, huge wrap around porch. Wonderful place to grow up, but my Dad spent all of his spare time repairing it, and my Mom had a lot to keep clean. Fun for a kid, but boy, I wouldn’t want to know what it costs to heat that place! Never thought I’d end up in a 50’s Cape Cod. Still miss all the beautiful woodwork and heavy paneled doors. We raised four BOYS in 1100 sq. feet. I thought I was going to lose my mind. My husband didn’t want to move because he loved our acreage/country setting. It was two kids per bedroom in bunkbeds and one full bath. It made me very organized and I routinely sent loads of things we didn’t need to consigment stores. Now that they’re gone, we’re just clanking around in this quiet, empty house with way too much yard to mow. We bought a lot on a golf course and are going to build. Gotta make room for future daughters-in-law and grandchildren! We’re shooting for 1800 sq. feet with a dining room and finally, a laundry room on the main floor! Gosh, all this downsizing philosophy makes sense, but it seems we do everything backwards. We’re in our 50s, and 800 square feet is the biggest apartment we’ve ever had, together or single. (No kids. )But we have thousands of books crammed in here and we want to see what life would be like in a real house, to have a garden and a place to lounge around outside in good weather. We live right in Boston, and everything — I mean everything, including Trader Joe’s — is at our doorstep or a pretty stroll away. The house we’ve fallen in love with is in a small town miles outside of the city, and it’s not close to anything but the subway to Boston. (I don’t drive.) It’s either 3400 square feet (listing sheet) or 6500 square feet (tax records, which include an unfinished attic and the basement). Someone, please tell us we’re crazy!! But did I mention that the house is a perfectly preserved, elegant Queen Anne with four fireplaces, natural woodwork and original details everywhere, and everything we’ve ever dreamed of? And that it’s half the price of a two-bedroom condo in our neighborhood? We’d save a small fortune, even with heating bills. We’re really torn, and it’s partly because we’ve never lived in a huge house in a suburban town, and don’t know what it entails. Can someone enlighten me? We’ve been house-hunting for two years and it’s very tough to find affordable, reasonably sized old houses in Boston’s walking-friendly neighborhoods. Any chance you could rent it, or another house, to see if that’s the investment and change that you are looking for? It IS heavenly, not sharing a wall with another family, and having breathing room inside and out. And while I’ve always lived in areas where I could walk to shops, I can’t imagine living in a large house without a car. All of the supplies for redoing the house, and working on the garden would have to be delivered. Also, you’ll need to factor in the cost of the utilities into your decision. It does sound like a wonderful house though. When I was researching this subject I found an article about small homes which stated that the trend of downsizing was also reflected in an annual Mayflower Transit Van Lines study, which reported that the average household moving weight had decreased by 10% since 1997, including a 2% drop from ’07 – ’08. Well, I wonder what that would reflect now given that those figures are almost 5 years ago. The director of the marketing communications is quoted as saying that it is due to homeowners “transitioning away from McMansions to smaller, more sustainable living environments.” I still find that interesting given that in my area those large McMansions are still being built at the expense of existing old bungalows. It would be nice to see quality over quantity which seems to be what the whole McMansion craze was about. Character is important to us also, so nothing cookie cutter. We love the older homes that have quality and character along with being unique. Our home was built in 1936. Before us, at least 2 families with 5+ kids lived very comfortably in a 1800 sq ft home and so did many other families of that era. Our home was considered large for that time. Right now it seems the perfect size and we use all the rooms-even the formal dining room which I love. Nothing gives a dinner or holiday that special quality like a formal dining room. Maybe that falls under ‘quality of life’ and we don’t all want that! We downsized 15 years ago to about 1,000 sq. ft. and for just the two of us it is perfect. We have finished off the attic for storage, but find that we accumulate less because we don’t have the space. We ask ourselves, “do we really need it?”. Christmas is spent in the mountains skiing so we don’t have to deal with too many people in a little house in the winter. It is a beach house so we spend a lot of time outdoors. Living smaller means less time cleaning and more time on the beach. We love our 1928 Tudor – they don’t build them like it today! I love the size of our home, its modest but just right for the two of us. We always say if we won the lottery we wouldnt want a bigger home. We each have a room for an office/computer room with an extra bedroom/bathroom up in the attic space, brand new if we have overnight visitors. A livingroom, kitchen/eatting area, laundry room, is just prefect. Less to clean and less to furnish. When we got this home a couple of years ago we did redo the kitchen and bathroom and the half bath. On the list above I think I would agree with not having any wasted space, smart design, flows right. Ive never been a collector and enjoy not having clutter , but having some storage space for things is nice. At the end of the day I think we all want a home that we hope will hold its value. Julia , I hope you had a great party/sleepover! Thanks so much for sharing your blog with us. I’m late to this thread, but interesting post. Everyone’s circumstances are different (size of family, budget, local housing costs), but I know I love my 2,000 sf Cape Cod house built in 1928 where we raised our two sons. We have a large living room and dining room (which we opened to the kitchen), so there’s plenty of gathering space. On the other hand, we have tiny bathrooms. The secondary bedrooms are larger than the ones you see nowadays. We never had a separate family room or den, which suited us. I always thought it was silly to have the separate formal living room and dining room and den/family room which was popular when I grew up (50’s – 60’s) and persisted, at least here in the south, through the 2000’s. It meant smaller, less usable rooms and a choppy floor plan, and two formal rooms that were rarely used. I have an attic and basement for storage. I will miss those when we move to our 1440 sf vacation/retirement home. We intend to add on a main floor master (which we have now), but only add 300-400 sf, utilizing an existing bath. We’ll still be well under 2000 sf. I love having a nice size lot (relatively speaking), and think landscaping is important, especially for privacy in neighborhoods. I HATE seeing huge houses crammed on tiny lots filling a subdivision. No privacy at all even with fences, and anyone can look down from their 2nd floor windows onto the neighbors’ deck and yard. Not to mention the developers took out every tree (which would have given some privacy, as well as beauty and other benefits). Sorry! Pet peeve. Personally, I think houses built from the teens to the thirties have a lot of the kinds of things we want nowadays – well crafted with natural materials, smaller footprint but larger living spaces, a connection to the outside (often large porches), and that elusive charm factor. Today, we just want bigger, more open kitchens, and more and larger bathrooms. Put those together and it’s pretty near perfect. The most important things to me in a home is that it is designed with energy efficiency in mind, the layout is well planned (i.e. no wasted or unused space), there is plenty of storage and ample natural light. Personally I do not feel that 1,791 square feet is enough space for a typical family of four. I’m all for houses in the 2000 to 4000 square foot range as long as each space has a purpose and is used fairly frequently. When my husband and I move out of our one bedroom apartment and are able to build a house the top three rooms on my priority list will be the kitchen, laundry room and mudroom. In my opinion these are the most important rooms in the house as they see a lot of use, but tend to be severely lacking (or not exist at all) in most homes. I love this post! and apparently so do a lot of other people! I live in an older neighborhood just outside the edge of the city of Richmond, Va. Every year, I see more and more folks trading their McMansions for the quality and smaller sized older homes in my neighborhood. There’s something to be said for craftsmanship of older homes and their charm. Plus, you can always move in and customize them to your liking! Our home is about 1,900 sq ft and I sometimes feel that it’s too big for the three of us! I agree with a good bit of that survey. Buying (if you intend to stay put awhile and not flip) is still a good investment in the right location. Downsizing is the result of a sluggish economy probably, but “Hallelujah!” if this is the end of McMansions everywhere. We bought a house with 1850 sq.ft. of space, a kitchen that could use some serious upgrading (1980 built and the oven and cooktop are original), and the bathrooms are similarly stuck in a time-warp. Bathrooms will probably come first, just as in the survey. Our home is 8 years old. We have already upgraded the kitchen with new countertops, wood floors, glass back splash, light over the island, a new island that looks like a piece of furniture in place of the cheap looking stock island. most people I know would rather have the walk in shower. Kelly, we added a master bath to our 1936 home and even though we had plenty of room for a tub and shower, we both decided to skip it and go with the walk in shower. NO REGRETS. We have a tub in the main bath if someone really wants a bath, but I think most people are shower people and the bathtub is only for ‘impact’ or resale according to those shows on HGTV. Like you said, why put something in that takes up that much space? Since a lot of people on this post are requesting smart design and more usable space, you would think the underused bathtub would be one of the first things to go. We did a half reno on our bathroom (vanity change up) but I definitely want to upgrade the kitchen. Not necessarily with a full reno, just some clever upcycling. We’ll see. We live in the suburbs in a small house by McMansion standards, 1300 sq feet. It’s great for us for right now. Eventually we would like to save up and move to an older farmhouse in the country. But that’s down the line. I think it’s important to remember that the homes that people may want to live in, aren’t necessarily the homes they can afford to buy. And people live in different homes at different times in their lives to suit their family’s needs. Especially in our market here, where houses sell faster than people can blink. When we bought our house 8 years ago, we were moving out of Boston with a baby and a puppy. We were looking for a house in a great town with great schools. We just considered it a “starter home” and then real estate plummeted. Now our family of four and two dogs are still living in our 1600 square foot cottage on the New England coast. We have 6 rooms, 3 bedrooms, 2 living rooms, a nice sized kitchen and 2 full baths. The layout is one level and set up nicely. The kids bedrooms are in the front and our master is in the back. The original part of our house was tiny and built in 1920 as a vacation beach cottage and has had additions over the years. I love living right on the water in this cozy house and my daughter swears she will never leave this house. Considering she is 9, I’m sure her views will change, but it makes me feel so good to know that although many of her friends live in huge houses, she considers ours perfect. We always thought we would move into something larger, but we love our location and the kids are happy. Now we’re considering adding a garage/mudroom and we just put in an outdoor shower which is nice when your kids are coming home sandy all summer. We’ve also started upgrading the kitchen and will need a new deck soon. I think once the kids are grown it will be nice to have this house (mostly as a summer house) and get a studio in the city for my husband and myself. We live in a town where we can ferry to and from Boston. So maybe that will work out for us. That sounds like a wonderful life and a wonderful plan Alison! That “stone house on Meridian in Indianapolis” is but one of many gorgeous older mansion style homes in that area. North Meridian – north of about 42nd Street and on up – is widely known for it’s marvelous old architecture. There are many old Colonial Revivals and the half-timbered English style mansions, and it just continues on down the side streets beyond that. That area was where the original rich and famous Indianapolis entrepreneurs built there homes “away from downtown” but close enough to be convenient to get to their businesses. The Governor’s Mansion is on North Meridian not too far from downtown. I have lived in Indiana since 1977, and lived and/or worked in Indianapolis for over 20 years. That part of Meridian is well known to me as I used to work at Methodist Hospital south of there. I have a hard time driving up Meridian Street by myself because I get caught wanting to admire all the gorgeous old homes!